When the lights go out at the top of the show, some audiences of kids (if there are not a lot of parents in attendance) will start to scream. (They are not scared, they're just reacting to the excitement.) This may make it hard to hear the opening SFX. To fix, try starting the SFX before the lights go down. There are two times (other than the tuning bits) when the orchestra plays and is stopped by the actors. This sort of thing flies in the face of standard orchestra protocol; most people are in awe of symphony orchestras, and most actors will be afraid to stop the orchestra in the middle of a phrase. Also, when told to stop, musicians stop very quickly. The comedy is much better served if the musicians keep playing both the Eroica excerpt and the Violin Solo bit. This is all easily overcome with a little repeated encouragement, just tell the actors it is okay to interrupt the orchestra, and tell the musicians to keep playing for a while in order to enhance the comedic effect. The hardest part of the show, technically speaking, is the ending, where a spot cue, a sound effect, and a bunch of feathers all have to happen in tight timing. Just be prepared to spend a little time getting it right, the poor spot and sound guys have had little to do for 50 minutes and all of a sudden everything is popping all at once. Also, the comic idea behind the 2nd perc's multiple instrument demo is that he didn't know they would have to do it, so he/she is running around in a hurried disorganized fashion, barely keeping up with the DA's listing of the instruments. I don;t want to step into director role, but in general, faster is better than slower. Feel free to play it up with dropped instruments, entire tables of small items falling over, whatever. Woodwind testimony: The Woodwinds always have a tendency to want to ad lib in this show. It could be out of envy for the clarinet having one of the biggest laughs in the show. (In the original version, each woodwind had a separate section all to themselves, but those had to be cut due to time constraints. The union usually puts a 1-hour limit on the amount of time you can spend developing new customers). The other woodwinds always mean well, but you should explain to them that they are there as "straight men," and if they clown around it usually isn't good for the actors. The one exception is the clarinet testimony, where the clarinetist should really play up his/her inability to play the cat theme (for example, multiple attempts, stomping their foot like a beginner, taking his/her clarinet apart to look for obstructions, blowing in the keyholes, etc.). Here is an overly long explanation of an inside joke: clarinet seats are, arguably, the most competitve hard-to-get seats of all the seats in an orchestra, as there are so many clarinet players and so few clarinet seats. I have never been in any orchestra, student or otherwise, where the first clarinetist wasn't spectacular. So they were the perfect ones to use in creating a situation where everyone has to sit through the painful procedure of watching someone try to fake their way through doing something even though they obviuosly have not done their homework. Kids are very familiar with the concept of being called on to do something in front of the class when they are not prepared. That commonly shared anxiety translates to big laughs when they see someone else having to do it. Horn testimony: Take a moment and explain to the horns that they should keep playing for a while after the DA shouts at them to stop, and explain to the 3rd horn that he/she has to keep playing for a few bars after everyone else stops. And the other 2 players should elbow him to get him to stop. The idea is, everyone is talking in study hall, then the teacher walks in, but one kid doesn't see the teacher and gets caught talking alone. There are two times when the duck theme is played. In both cases, dialogue should go on over it. Wolves please note: I always intended the open of the show, and any other time you are addressing the audience, to be an ad lib situation. Depending on the culture of the audience, it may take up to 3 tries of saying "you believe me, doncha? Doncha? Doncha??" before the kids in the audience will respond. YOu may also have to ad lib if the kids DO beleive you at the end. Also, fyi, it is generally not a good idea to touch the musical instruments, but it is fun if you occasionally touch the players and Peter in a sickeningly phony friendly way. District Attorney, you may need to ad lib an extra "ta-ta, good bye, adios" (gradually fading) as you exit in the spotlight, otherwise it may feel sonically empty. Just be sure to be done before the belch happens! Note, some feathers will hang in the air longer than others. Get the down pillow variety if possible. A quick note about the "irregardless" gag: I had originally just written a line for the judge saying "irregardless of the metaphoricalness of the situation . . . ," implying the judge had very poor English skills. No one ever noticed the word "metaphoricalness," but after every show someone would always come up to me and, in a voice one normally associates with being told one has something in one's teeth or that one's fly is open, they would say, "Justin . . . 'Irregardless' is NOT a WORD." Realizing that this was a sore point in many quarters I changed the gag. The District Attorneys are usually selected for their acting ability, and not for their experience as an orchestral narrators. Be prepared to do a great deal of cuing. Please note the system of ">" marks in the script: A ">" denotes the beginning of each cued Narration section. A "(>)" denotes cues that come in quick succession. There are numerous bits and pieces of incidental music played during the testimony sequences (the Duck theme, the string testimony violin solo, and the horn testimony bit of Beethoven's 3rd). To enhance the comedic effect, I suggest that you do not take cues too literally; in general, I think it is better to be early than late. In the case of the Duck Theme (which occurs twice), you can anticipate the cue; in other words, you should be playing it by the time the actor gets to the lines where it is cued. It is also important, in the Beethoven horn bit, that this bit of music begins right on cue, with no hesitation. Also, your Wolf and District Attorney may need coaching as to when to interrupt these excerpts. As a general rule, they should do it sooner rather than later. Make sure they understand that they are in control of that, and encourage them to be aggressive. But don't make it easy for them! They should have to yell a little bit to get the musicians to "shut up." Very important: Please do be aware that the distance between the drum set and the trumpet and trombone during their testimony often creates an ensemble problem, as the set drummer can't always hear his cues. Also, if you are short on rehearsal time, make sure the trumpet and trombone know they are tacet for the wolf exit music (the last 4 bars of Peter and the Wolf), as there is a risk of their playing the bows music. When the Judge tells you to tune now "and get it over with," you should have a cue worked out with the concertmaster so the Judge knows when to rap his/her gavel. Make sure the orchestra is still tuning when you give the cue! Toward the end of the show, during his testimony, "Peter" will come up to you to borrow "the score." Any small book or score will do for this purpose. Conductors, please note that you have two lines. Since they probably won't give you a mike for 2 lines, be sure to enunciate, speak up, and face the audience, even though you are addressing the Judge. 40 minutes for rehearsal of "Peter and the Wolf"
That's it; thanks so much for your interest in my work, and I hope you have the best kids' concert ever! 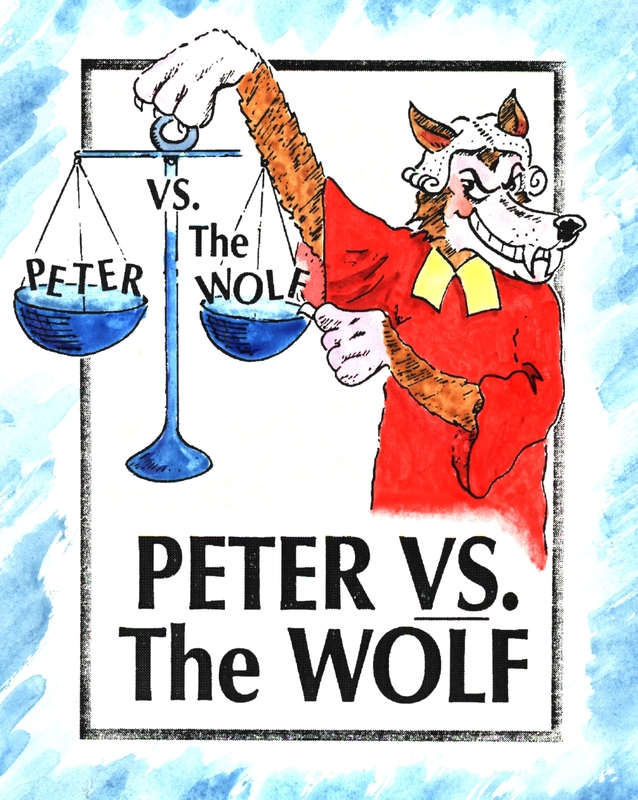 Since "Peter VS. the Wolf" has never been done on national television, most of the people who have staged it (and their audiences) have never seen it before. With both audiences and presenters unfettered by any preconceptions of how the piece should be done, every production I have seen has been unique, and thoroughly delightful in its own special way. In all these many incarnations, the show has been a consistent hit with audiences of all ages on four continents. There have been only two occasions when the show was given lukewarm reviews. In both cases I discovered after the fact that the people producing the show had made major changes to the script. I don't want to rant about this too much -- I have learned that, when people want to change your work, it is actually a sort of compliment. But I do advise all people presenting this program that this script has been revised and polished to an extraordinary degree. Hundreds of hours went into developing it into its current form. Of course, in live theater one must allow for the occasional actor ad lib, and I would hate to see any stage director feel constrained from executing their creative vision, as there seems to be a virtually infinite number of ways to stage this piece. But I strongly recommend that presenters resist the urge to change the words on the page. If past experience is any indication, I can virtually guarantee you a successful event if you do the piece as written. Don't ask me why it works so well, I cannot explain the universal appeal of this piece. I realize that this is an unusual work in many ways. Orchestras are not generally used to mixing with actors, and musicians don't usually become actors themselves, so in this unfamiliar format it is easy to get nervous. But have a little faith and you will be fine.